A colossal fire broke out at the iconic Notre-Dame Cathedral in central Paris on Monday. This incident broke hearts of thousands of Parisians who watched in horror as a ferocious blaze devastated the Cathedral, destroying its spire and a large part of the roof. Both the spire and roof of the cathedral collapsed and footage from the scene showed flames inside one of the building's two towers. According to CNN, after 15 hours of struggle, the Paris fire service announced that fire at Notre-Dame cathedral has been extinguished. This main structure of the cathedral in central Paris was salvaged after hours of fire-fighting. The fire incident took place at a time when renovation works were being carried out at the site. Also, the Paris prosecutor opened an investigation into the fire as the cause of which is still unknown, reports CNN. Paris' fire department has also released a video documenting their efforts to extinguish the Notre-Dame fire. The footage shows dramatic close-up scenes of the fire, as well as overhead shots which illustrate the extent of the blaze. Around 400 firefighters were involved. On looking at this dramatic site, French President Emmanuel Macron has vowed to rebuild Notre-Dame Cathedral in Paris. He expressed relief that "the worst had been avoided" in a blaze that had at one point threatened the entire edifice, and left France in shock over the damage to a building described as the soul of the nation. 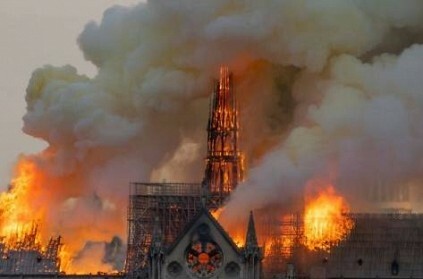 Meanwhile, French billionaire Bernard Arnault, who controls the sprawling LVMH luxury conglomerate, said that his family and the company would contribute a combined 200 million euros ($226 million) to help rebuild Notre-Dame cathedral after it was gutted by fire. Not just that, renowned leaders of the world shared their memories of visiting Notre Dame in response to the blaze. UK Prime Minister Theresa May took to Twitter and said "My thoughts are with the people of France tonight and with the emergency services who are fighting the terrible blaze at Notre-Dame Cathedral". US President Donald Trump too tweeted stating that "So horrible to watch the massive fire at Notre-Dame Cathedral in Paris. Perhaps flying water tankers could be used to put it out. Must act quickly!" while Barack Obama too grieved over the situation saying, "Notre Dame is one of the world's great treasures, and we're thinking of the people of France in your time of grief. It's in our nature to mourn when we see history lost - but it's also in our nature to rebuild for tomorrow, as strong as we can." Media reports by The Independent state that, the cathedral, which was built in the 12th and 13th centuries, began undergoing renovations recently in an effort to repair damage from time, pollution and weather. ‘என்னது? இதையெல்லாம் ஒலிம்பிக்ல சேக்க போறாங்களா?’.. குஷியில் ரசிகர்கள்! "என் மீது சிறுநீர் கழியுங்கள்"...சர்ச்சையில் அதிபரின் சிலை! ஷூவில் மாட்டிக்கொண்ட டாய்லெட் பேப்பர்...வைரலாகவும் அதிபரின் வீடியோ ! 'தடைகளை உடைத்து'...அமெரிக்க அதிபரின் பாதுகாப்புப் பணியில் கலக்கும் இந்திய வம்சாவளி இளைஞர்! அமெரிக்கர்கள் ஏழையாகிவிடுவார்கள் ...டிரம்ப் அதிரடி ! This page contains news relating to various facts and events. The views are generally about current affiars and general topics in diversified areas such as political, international, national, and regional issues, sports, health, travel, lifestyle, technology and business. People having similar interets on the above topics will find this page useful. Massive fire at Notre-Dame Cathedral in Paris doused after 15 hours. | World News.